This mandarin cake, is light, aromatic and moist. I love this Mandarin Cake as it has mandarin juice, zest, as well as mandarin marmalade. It’s perfect with a cup of Greek coffee and I eat it even for breakfast! I always love to use ingredients that I have at home. As I mentioned in my previous post, our mandarin trees are packed with fruit. These mandarins are delicious but unfortunately we don’t eat them as a fruit as I am allergic to the pips and my husband doesn’t like the. Our local neighbours have their own mandarin trees, so I only give some to my Athenian neighbours, who have their summer houses next to us. They rarely visit during winter but when they do, I give away a lot. When we visit Athens, I bring along some with us for our children but they only like them as juice because of the many pips in them. I usually make a lot of marmalade, I make liqueur and use them in other recipes as well. To make good use of them this time, I decided to also make this delicious and aromatic cake that is light as sponge cake, moist inside and smells amazing. 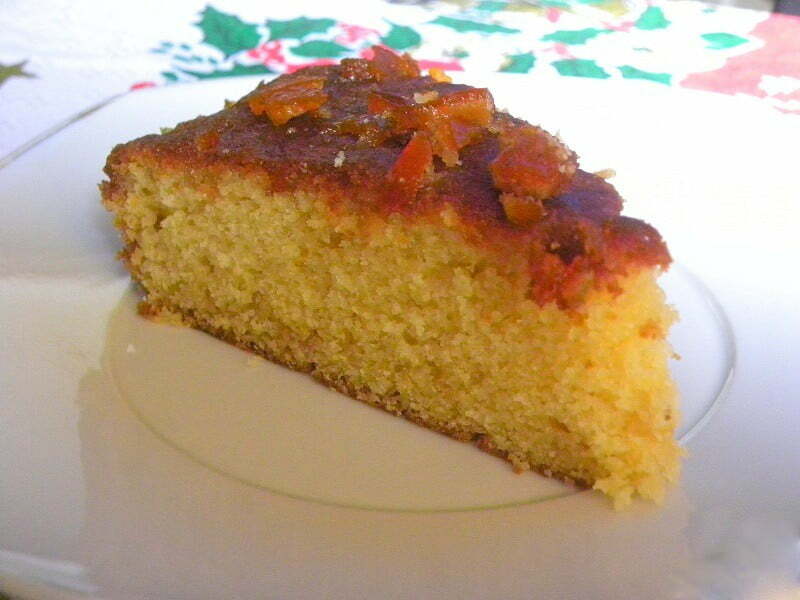 I used the juice and zest in the cake but also used some mandarin juice and Mandarin Marmalade to glaze the cake. The syrup is absorbed making the cake even more moist and tender and the pieces of mandarin stay on top as decoration, each bite filling your mouth with the amazing taste and aroma of mandarins! Beat the butter with sugar on high speed until white and fluffy. Add egg yolks one at a time until incorporated. Add mandarin juice, vanilla and zest and mix. Sieve flour with corn flour, baking powder, baking soda and mix in salt. Lower mixer speed to minimum and add some flour mixture alternating with meringue until all the ingredients are added. Position baking rack in the middle of the oven. Grease and flour a 26 cm round baking pan or line it with parchment paper. Bake in a preheated oven to 180ο C / 350o F for about 45 minutes or until a toothpick inserted in the centre comes out clean. Sieve the icing sugar and mix with the mandarin juice, until the sugar dissolves. Add the marmalade and mix. As soon as the cake is out of the oven, while it is still hot, using a spoon, baste with the mandarin glaze. Wait until it cools completely before cutting the cake. I love that tender soft crumb and the fresh citrus aroma must be very awesome! Mmmh… The cake looks amazing. I never heard of a mandarin cake. I will try it! Thanks Ivy.